Cover art for 1939 hardback edition of “The Grapes of Wrath,” published by Viking Press, New York. Cover illustration by Elmer Hader. Click for 75th anniversary edition. The Grapes of Wrath is a Pulitzer Prize-winning novel written by John Steinbeck in 1939. Not only was this book a landmark social commentary in its day and a major publishing success, it became an award-winning and profitable Hollywood film, and also inspired at least two rounds of music — one by Woody Guthrie in 1940 and another by Bruce Springsteen in the 1990s. First, the book. The Grapes of Wrath focuses on a poor family of Oklahoma sharecroppers named the Joads who are driven from their home and land during the 1930s Dust Bowl and Great Depression. The story tracks the family’s near hopeless situation as they set out for California along with thousands of other “Okies” in search of land, jobs, and dignity. Along the way they face suspicion and contempt, and once in California they are harassed and persecuted as transient labor, exploited by wealthy farm owners and their hired police. All of this has a radicalizing effect on the novel’s main character, Tom Joad, who starts thinking in broader social terms, beyond himself — part of the message Steinbeck intends. John Steinbeck was born in Salinas, California in 1902. His father served as the county treasurer; his mother was a teacher. He graduated from the local high school in 1919, working summers as a hired hand on California farms and ranches. Attending Stanford University for six years without obtaining a degree, he decided in 1925 to pursue a writing career in New York. There, while writing, he also worked as a bricklayer, reporter, and manual laborer, but failed to find a publisher. He returned to California in 1927 where a series of novels followed — Cup of Gold, The Pastures of Heaven, and To a God Unknown — all of which were poorly received. Better notices and critical success came with Tortilla Flat in 1935, In Dubious Battle in 1936, and Of Mice and Men in 1937. Steinbeck then traveled to Oklahoma, where he joined a group of farmers embarking for California, living and working with one family for two years. This experience became the basis for The Grapes of Wrath. 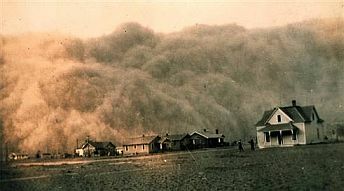 Dust Bowl-era storm near Stratford, Texas, April 1935. Click for DVD. Published in New York by Viking Press and released in mid-April 1939, the novel provoked controversy, as it was a pointed protest of the nation’s economic plight and particularly that of poor farmers. The novel’s structure was somewhat unique in that it mixed historical background chapters with the novel’s plot and characters. Steinbeck’s voice, however, is found in Tom Joad, the novel’s main character. Joad is first seen returning home to Oklahoma after a jail sentence for killing a man in a brawl, only to find a devastated landscape with local farms being repossessed by the banks. Tom and an itinerant preacher accompany Tom’s family on their trek to California over highway 66. Through Tom Joad, Steinbeck builds a slow-burn anger and sense of injustice over the migrants’ misery.The book was publicly banned in some places, burned in others, and heatedly debated on the radio. They are plagued not only by bad weather and misfortune, but by exploitive California farmers who deliberately degrade the migrants to keep them powerless. The book proves a powerful tale of social injustice. At its release, The Grapes of Wrath became controversial and something of a national event. In fact, the book was publicly banned in some places and burned in others (see Rick Wartzman book & interview in Sources). It was heatedly debated on the radio. Reviewers were initially split. Some loved it, others were highly critical. One reviewer for the London Times named it “one of the most arresting [novels] of its time.” Newsweek called the book a “mess of silly propaganda, superficial observation, careless infidelity to the proper use of idiom, tasteless pornographical and scatagorical talk.”A reviewer for the New York Times, although critical of the book’s plot structure, said: “. . . Steinbeck has written a novel from the depth’s of his heart with a sincerity seldom equaled. It may be an exaggeration, but it is the exaggeration of an honest and splendid writer.” The Associated Farmers of California, displeased with the book’s depiction of California farmers, denounced the book as a “pack of lies” also calling it “communist propaganda”. 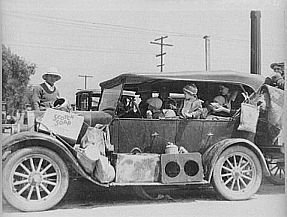 Oklahoma refugees in California, 1935. Although Steinbeck’s book had it critics, prominent defenders also emerged — among them, First Lady Eleanor Roosevelt who stated publicly that she never thought the book was “exaggerated” as some critics had charged. Life magazine in June 1939 ran a two-page spread on Steinbeck’s book and the issue of migrant workers, with photos showing the grim conditions. For many who read the Grapes of Wrath, the book left a strong emotional impression. Yet Steinbeck, for his part, refused to publicly promote the book, believing it had to stand on its own merits. The first printing of the hardback edition was large for its time — estimated between 20,000 and 50,000. By February 1940, The Grapes of Wrath was in its 11th printing, amounting to more than 430,000 copies. In 1939, it became the best-selling book in America and was among the top ten bestsellers again in 1940. Steinbeck received a Pulitzer Prize for the novel in May 1940. The book brought death threats to Steinbeck, charges that he was a Communist, and surveil- lance by the FBI. The Grapes of Wrath did help to improve migrant conditions, but it also brought threats on Steinbeck’s life, charges that he was a Communist, and surveillance by the FBI. Steinbeck continued his career as a writer, publishing other notable works, including: The Moon Is Down (1942); Cannery Row (1945); The Pearl (1947); East of Eden (1952), The Winter of Our Discontent (1961); Travels With Charley (1962); and others. Seventeen of his works went on to become films, and he also worked as a Hollywood writer. In 1962, Steinbeck was awarded the Nobel Prize for Literature with the Nobel committee citing the Grapes of Wrath as a “great work” and one of the committee’s main reasons for granting Steinbeck the Prize. The copyright for The Grapes of Wrath was renewed in John Steinbeck’s name in 1967. At the 50th anniversary of the book in 1989, it had sold close to 4.5 million copies in the U.S. alone, with worldwide sales then reaching about 14 million. Paperbacks were then selling at a rate of about 100,000 a year. 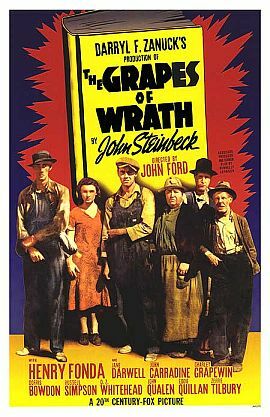 1940 poster for the Grapes of Wrath film, includes image of book and Steinbeck's name. Click for poster. In 1939, even while the book was still in its controversial first flush, plans were made to produce a film version of the story. The film rights were acquired by Darryl F. Zanuck of 20th Century-Fox who assigned the project to his top director, John Ford, already famous for a bevy of successful westerns. Zanuck, however, was nervous about the novel’s hard left political views and sent private investigators to Oklahoma to check out the “Okies” predicament first hand. Finding them true to life, Zanuk became confident he could defend attacks that the film was pro-Communist. But Zanuck also watered down the novel’s tone for the film, departing from the book in places, which some believe made story more saleable to the public. The film had an excellent cast, including Henry Fonda playing Tom Joad, Jane Darwell as Ma Joad, and John Carradine as the itinerant ex-preacher, Jim Casy. Production ran from early October 1939 through mid-November 1939. It premiered in New York City and Los Angeles in late January 1940 and to the wider public in mid- March 1940. “The Joads step right out of the pages of the novel that has shocked millions!,” said one of the studio’s promotional pieces. At its release the film was very well received, but like the book, still had its detractors for its leftist political tone. Still, the movie helped to keep Steinbeck’s book on the bestseller list. Grapes of Wrath VHS release, 1998. Many of the film’s visual images were true to life and resembled the migrant worker photographs that had been taken by Depression-era photographers Dorothea Lange and Horace Bristow. Life magazine ran a story in January 1940 showing some of the similarities between the film sequences and actual photographs of migrants and their living conditions. The movie won Oscars for best director, John Ford, and best actress, Jane Darwell as Ma Joad. It was also nominated in five other categories, including best actor for Henry Fonda’s role, and best picture, losing that year toAlfred Hitchcock’s Rebecca. Through the 1950s, The Grapes of Wrath was often named the greatest American film, though in subsequent years it was outranked by other films, such as Citizen Kane. But the American Film Institute still ranks it among the top 50 films of all time, and the Library of Congress has designated it for historic film preservation. VHS versions of the film were released in 1988 by a division of CBS/Fox, and again in 1998 by 20th Century Fox for its Studio Classic series. A DVD version with extra commentary and historical information was released in April 2004 by 20th Century Fox Entertainment. 1940: Woody Guthrie's album, "Dust Bowl Ballads." Woody had a half-gallon jug of wine with him, sat down and started typing away. He would stand up every few seconds and test out a verse on his guitar and sit down and type some more. About one o’clock my friend and I got so sleepy we couldn’t stay awake. In the morning we found Woody curled up on the floor under the table; the half gallon of wine was almost empty and the completed ballad was sitting near the typewriter…. 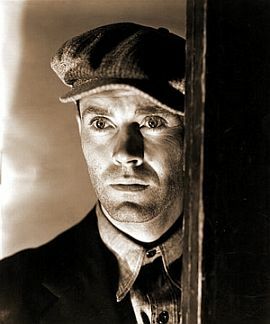 Henry Fonda as Tom Joad in the 1939 film version of The Grapes of Wrath. Guthrie’s song, meanwhile, “The Ballad of Tom Joad,” was first recorded at RCA Studios, Camden, New Jersey, April 1940 and released on an album titled Dust Bowl Ballads in July 1940. Later albums, also including the “Tom Joad” song, were released in 1964 and another in 1977 by RCA under the title, Woody Guthrie: A Legendary Performer. A CD version was released in 1988 and is also available in a newer CD version by Buddha Records, released in 2000, with some extras. But Woody Guthrie’s song on The Grapes of Wrath tale wouldn’t be the last such music. 1995: Bruce Springsteen album, "The Ghost of Tom Joad." In November 1995, rock star Bruce Springsteen, who had risen to fame in the 1980s with hard-driving rock ‘n roll music that often captured working-class concerns and themes, released an album titled The Ghost of Tom Joad. This album, a more acoustic-styled collection of tunes rather his normal rock ‘n roll fare, is supported by guitar, piano and harmonica. Its title track directly references the Grapes of Wrath’s main character (see lyrics below). The album also features other songs that focus on the lives of steelworkers, illegal immigrants, and migrant farmers. Springsteen’s single from the album, “The Ghost of Tom Joad” was later covered by the alternative metal rock group Rage Against the Machine on a November 1998 CD single and a 2001 album. In 2006, the song was covered again on a EP by Swedish indie/folk singer-songwriter and classical guitarist José González who is affiliated with the group Junip. No home no job no peace no rest. Searchin’ for the ghost of Tom Joad. Bathin’ in the city aqueduct. Waitin’ on the ghost of Tom Joad. With the ghost of old Tom Joad. The Grapes of Wrath today is regarded as one of the great American novels of the 20th century and remains one of the world’s most famous books. It is frequently cited on “best book” lists that appear from time to time. In 1998, the Modern Library ranked The Grapes of Wrath at No. 10 on its list of the 100 best English-language novels of the 20th century. In 1999, French newspaper Le Monde ranked The Grapes of Wrath No. 7 on its list of the 100 best books of the 20th century. In the U.K., the book was listed at No. 29 of the “nation’s best loved novel” on a BBC 2003 survey. Time magazine in 2005 included the novel in its listing of the “100 Best English-Language Novels from 1923 to 2005″. The Daily Telegraph of London in 2009 included the novel as well in its list of “100 novels everyone should read”. As for the film, which is also highly regarded, although it deviates from the book at the end, a special DVD with supplemental historian commentary was released in April 2004 by 20th Century Fox Entertainment. And in July 2013, Steven Spielberg announced plans to do a remake of The Grapes of Wrath film. At the 75th anniversary of the publication of The Grapes of Wrath in April 2014, there was renewed attention bestowed on the book and its author, with commemorative events occurring throughout the year at numerous museums, schools, universities, and book festivals. Viking-Penguin, the book’s original publisher, issued a special “75th Anniversary Edition” with the original cover art for the hardback book jacket by artist Elmer Hader. The School of Arts and Humanities at California State University at Bakersfield began its celebration of Steinbeck’s novel in October 2013 with a continued schedule of events in a number of state-wide venues through 2014. The Center for Steinbeck Studies at California State University at San Jose and the National Steinbeck Center in Salinas, California also commemorated the 75th anniversary with special programs. The Steinbeck Center launched a “Grapes of Wrath” oral history collection project to document present-day Joad family difficulties and share those stories online and at public programs – part of the 2014 National Steinbeck Festival. A number of authors and Steinbeck scholars also commemorated The Grapes of Wrath’s 75th anniversary, some offering special papers, essays, and lectures. In April 2014, for example, a Washington Post essay by historian Susan Shillinglaw, made a case for remembering the migrant women of The Grapes of Wrath – and the “Ma Joad” character in particular. 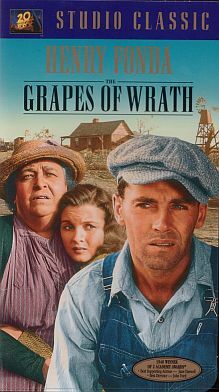 Scene from 1940 film, “The Grapes of Wrath,” from left: Doris Bowdon as “Rosasharn,” Jane Darwell as Ma Joad, and Henry Fonda as Tom Joad. In Shillinglaw’s essay – titled “Ma Joad for President” — she explored the strengths of Ma Joad using passages from the book. Shillinglaw wrote that the men in The Grapes of Wrath were stunned by the hardships they encountered, but the women adapted. Ma Joad, she explained, was “the family bulwark,” the woman who kept the family moving along route 66 to California. “Ma is a feminist – feisty, strong loving, resilient,” and the kind of leader, said Shillinglaw, that the nation might well consider in tough times. Author John Steinbeck, circa 1930. Cover of Rick Wartzman’s 2008 book, depicting p. 4 of “The Grapes of Wrath” in flames, apropos his book’s subject, i.e., the burning and banning of Steinbeck's book. Click for book. In 1979, the U.S. Postal Service issued a stamp featuring John Steinbeck, which began the Postal Service’s Literary Arts series honoring American writers. The stamp was issued on what would have been Steinbeck’s 77th birthday, Feb. 27th. “The Grapes of Wrath: John Steinbeck Writes A Major Novel About Western Migrants,” Life, June 5, 1939 (with photos by Horace Bristow). “Speaking of Pictures. . . These By Life Prove Facts in ‘Grapes of Wrath’,” Life, January 19, 1940 (with photos of Horace Bristow). Edwin Schallert, “ ‘Grapes of Wrath’ [film] Due for Much Controversy,” Los Angeles Times, January 23, 1940, p. 8. Richard Griffith, “Gotham ‘Goes Overboard’ on Steinbeck Picture,” Los Angeles Times, February 5, 1940, p. A-14. “Novel Flayed in [State] House; Californian Denounces ‘The Grapes of Wrath’ in Migrant Aid Debate,” Los Angeles Times, March 12, 1940, p. 2. The Grapes of Wrath, “20th-Century American Bestsellers,” Graduate School of Library and Information Science, University of Illinois, Urbana-Champaign, Illinois, 2006. “The American Novel,” American Masters, “1939, The Grapes of Wrath,” PBS, a production of Thirteen/WNET New York, March 2007. C-Span “Book TV” interview with Rick Wartzman, author of Obscene in the Extreme: The Burning and Banning of John Steinbeck’s the Grapes of Wrath, PublicAffairs Press, September 2008. Susan Shillinglaw, A Journey into Steinbeck’s California, Roaring Forties Press, 2006. Shillinglaw is scholar-in-residence at the National Steinbeck Center in Salinas, California, San Jose State University. Martha Heasley Cox Center for Steinbeck Studies, San Jose State University. Roger Ebert, Movie Review, “The Grapes of Wrath,” Chicago Sun Times, March 31, 2002. Woody Guthrie, article in one of his People’s World columns (1940), reprinted in Woody Sez, New York, NY, 1975, p. 133. Woody Guthrie, American Folksong, New York, 1961 (reprint of 1947 edition), p. 25. Pete Seeger, The Incompleat Folksinger, New York, NY, 1972, p. 44. W.J. Weatherby, “Mighty Words of Wrath,” The Guardian, Monday April 17, 1989. Library of Congress, “Forgotten People” exhibit, Depression Era/migrant worker sketchbook of Dorthea Lange & Paul Taylor. DVD Talk Review, Grapes of Wrath film review by Glenn Erickson. “The Grapes of Wrath,” Wikipedia.org. For a more recent perspective on Steinbeck’s work re: current economic conditions, see: Rachel Dry, “A Recession Only Steinbeck Could Love,” Washington Post, Outlook, Sunday, March 22, 2009, p. B-1. Rick Wartzman, Obscene in the Extreme: The Burning and Banning of John Steinbeck’s The Grapes of Wrath, Public Affairs, September 1, 2008. “Interview with Rick Wartzman, Author, Obscene in the Extreme: The Burning and Banning of John Steinbeck’s the Grapes of Wrath (PublicAffairs Press, September 2008), BookTV/C-Span.org, September 28, 2008. Nicole Cohen, “Last Chance To Read ‘Grapes Of Wrath’ Before It Turns 75,” NPR.org, February 17, 2014. Robin Young & Jeremy Hobson,“Steinbeck’s ‘The Grapes Of Wrath’ Marks 75th Anniversary,” Here & Now / WBUR (Boston /NPR), Monday, April 14, 2014. Susan Shillinglaw, “Ma Joad for President: 75 Years Later, ‘The Grapes of Wrath’ Reveals the Leader America Needs,” Washington Post, Sunday, April 16, 2014.